/EIN News/ -- FORT LAUDERDALE/DAVIE, Fla., April 17, 2019 (GLOBE NEWSWIRE) -- When Zachary Heller graduates in 2021, he will attend two commencement ceremonies—receiving his D.M.D. degree from the NSU College of Dental Medicine (CDM) and obtaining his D.O. degree from NSU’s Dr. Kiran C. Patel College of Osteopathic Medicine. These two degrees also will put Heller in an elite group of NSU graduates. Since its inception in 2007, only seven students have completed the D.O./D.M.D. dual-degree program, which is the only program of its kind in the United States. 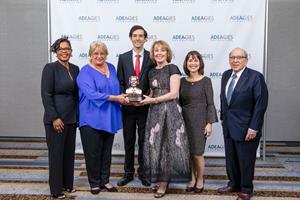 The innovative program helped NSU’s Colleges of Dental Medicine and Osteopathic Medicine earn the 2019 American Dental Education Association (ADEA) Gies Award for Innovation—Academic Dental Institution. The award honors individuals and organizations that exemplify the highest standards in oral health and dental education, research, and leadership. The award was presented in March during the annual American Dental Education Association meeting in Chicago, Illinois. “The dual-degree graduates are truly pioneers with an NSU Edge, integrating oral and overall health. These graduates are developing new types of practices that integrate medical and dental care as they care for their patients. Some are practicing dentistry incorporating medicine into their practices, while others are practicing medicine and incorporating oral health into their practices,” said Linda C. Niessen, D.M.D., M.P.H., M.P.P., dean and professor of the CDM. Accepting the Gies Award are, from left, Delia Celestine, M.P.H. Ed.D., assistant dean, student and alumni affairs, Dr. Kiran C. Patel College of Osteopathic Medicine; Elaine Wallace, D.O., dean, Dr. Kiran C. Patel College of Osteopathic Medicine; Aaron Goodwin, D.O., D.M.D., 2015 graduate of the D.O./D.M.D. program; Linda C. Niessen, D.M.D., M.P.H., dean and professor, College of Dental Medicine; Abby Brodie, D.M.D., M.S., associate dean for academic affairs, College of Dental Medicine; and Bruce Donoff, D.M.D., M.D., dean and professor, Harvard School of Dental Medicine who introduced the NSU team. The D.O./D.M.D. program launched in the fall of 2007 after 18 months of planning. Among the 35 U.S. colleges of osteopathic medicine, only NSU offers a D.O./D.M.D. program according to the American Association of Colleges of Osteopathic Medicine. This unique curriculum enabled the CDM to create a D.M.D. advanced standing program for a physician interested in pursuing an oral and maxillofacial surgery (OMFS) residency. OMFS residencies require a D.M.D. or D.D.S. to matriculate. “The curriculum was the most challenging aspect for the program to create a role for those who want to go into inter-professional practice,” said Abby J. Brodie, D.M.D., M.S., associate dean for academic affairs and the curriculum architect on the dental degree side of the program. According to Brodie, the dual-degree program does not favor one field of dentistry or medicine. “There’s much interconnection between oral health and systemic health. Osteopathic medicine treats the entire person, and dental health affects overall health,” she said. The year-round, continuous program is rigorous, with a heavy course load. The six-year curriculum consists of basic science and dental courses in the first year; the study of the respiratory, gastrointestinal, musculoskeletal, and other systems, as well as clinical practice, in the second year; while clinical rotations continue in year three. The dental curriculum resumes in year four; clinical dental courses, one-month medical electives, and a rotation in rural/underserved medicine make up year five; while year six is devoted to clinical dentistry and medical electives. “It’s not a program for everyone,” Brodie admitted. Zachary Heller will be the eighth student to complete the dual degree. Alexander Powell also is enrolled in the program, which will make him the ninth dual-degree student when he graduates in 2023. Heller said he is ready for the hard work—and future career benefits—the D.O./D.M.D. degrees will bring. “I am pursing a dual degree to become the best medical and dental practitioner possible. Having a dual degree will allow me to draw from a greater foundation of knowledge, which allows me to recognize and prevent complications before they arise,” said Heller, who plans to pursue postgraduate education, possibly in oral maxillofacial surgery. The William J. Gies Awards for Vision, Innovation, and Achievement are named for William J. Gies, Ph.D., who is considered the “Father of Contemporary Dental Education and Research,” according to the American Dental Education Association (ADEA).